Molly has just survived her first term down the road at the village primary school. ?I felt a bit guilty about?sending her to school so young? (only two days after her fourth birthday!) but it was a guilt that lasted all of a good, ooh, twelve minutes. That’s because she immediately loved it. And seemingly still does. Long may it last.??????
? 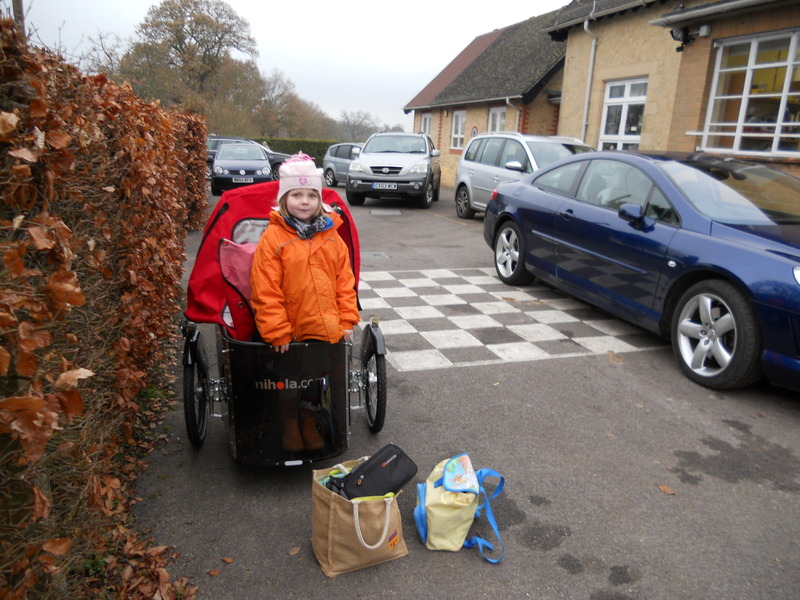 ?Though the word school run can strike fear into many parents’ hearts and though the build-up to it is fraught with angst and a race against time – trying to get Molly dressed as she careers?around the house with?her? pants on her head while pans of boiling eggs are boiling over and I’m skidding on squeezed-out slurries of spilt toothpaste and crashing into kitchen cupboards as babies are wailing and needing feeding and bottoms changed – the actual getting to school is a highlight of the day. It’s a rare moment of peace and serenity. Molly sits quietly and meditatively in the bike trailer, emitting the occasional observance of nature: ‘Looks like rain, Mummy!’? ‘Bit windy!’ ?’Nice clouds!’? ‘Lots of slugs and worms on the road this morning, Mummy!’ ?’Squashed squirrel!’? ‘Bit thick this fog!’ ?’Heavy rain!’? ‘Very frosty!’ ?’Snowing!’.? It’s like cycling with Michael Fish on board.????? ?Riding to school is so enjoyable I wish it could go on for ever. My only fault with?the school is that it’s?not a two-hour cycle away or, better still, a Cross-Channel ferry ride away. How nice to just be able to pick up the school and plop it in, say, the South of France or maybe even Spain. 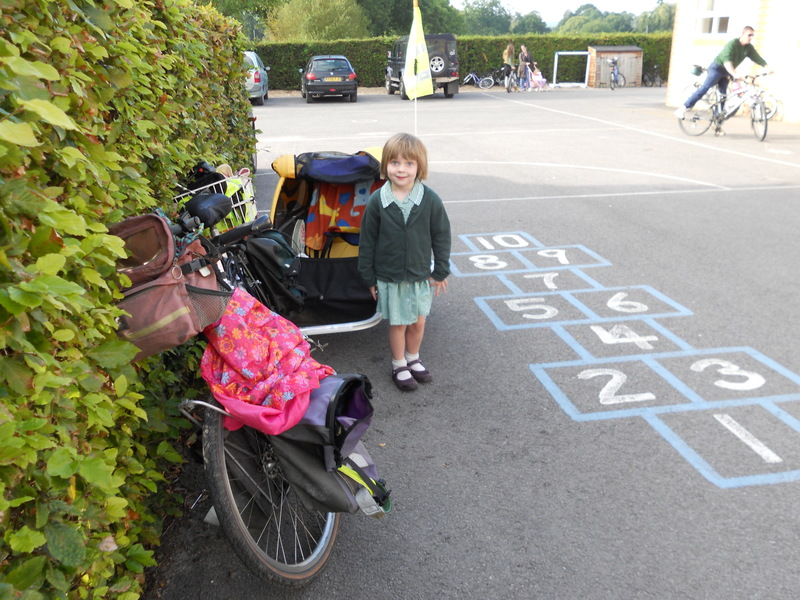 What a fine thing it would be to?spend two or three weeks cycling to get to school. You could do lots of camping and swimming en route, learn a bit of foreign lingo and indulge in exotic fare. Then spend maybe a week at school doing studious things before cycling on the several weeks-long school run home again. How fun that would be. I think I may have words with the head teacher about relocating the school every few weeks. How about putting it in Marrakesh one month and then maybe Phnom Penh the next? Now that would be a?school run worth going on.????? ?Recently the school?run (3 miles each way, twice a day with the odd detour just for fun) ?has?become even more fun because I have acquired a new steed to add to my fleet of?bikes. This one is more trike than bike. It’s called a Nihola.? ?Its made in Denmark, and you?can carry babies and grannies and school-children and bulbous bags and heaven-knows?what in its box (or ‘cabin’ as the manufacturers call it) in the front. In fact it can carry 100kg plus the rider?which is quite a mighty load. I’ve tried it! What’s more it’s?highly amusing?overtaking all the mad scrum of four-by-fours arriving at school. I tell Molly it’s our three-by.? Where wheels are concerned, less is more.????? ?Gary and I call the Nihola the Nihola Gay (in memory of OMD’s Enola Gay song) – and what with only about five Nihola’s in the country we’re thinking of setting up a Nihola Gay club. Anyway, I found the Nihola at Practical Cycles (see www.practicalcycles.com?for more weird and wonderful machines) and Zaynan Lythgoe ? 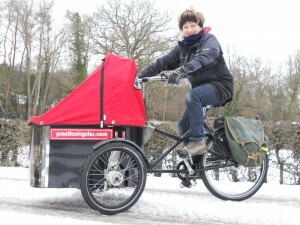 (Mr Practical Cycles man)?himself even put my Nihola in a Ford Trannie and drove it all the way? from Lancashire dodging major snow storms on the way – which was most impressive service.? What with all this snow and ice around the Nihola has been the only way to get Molly to school because unlike riding?my bike on ice you can’t fall off a trike – only slide. 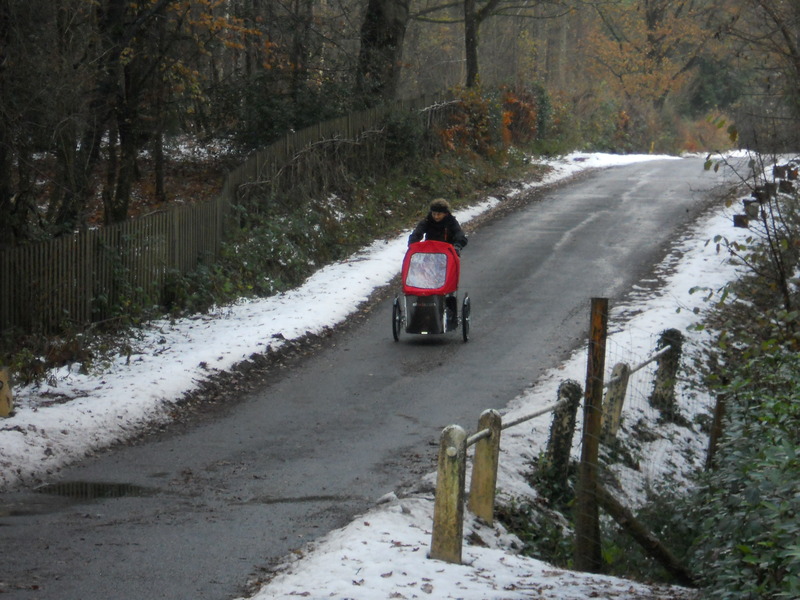 So school run or not, I’ve been doing a lot of snowy and icy cycling – and enjoyable?sliding. Who needs a four-by-four when you can have a Nihola Gay? And a lot more fresh-air fun. Even if it is minus 12.???? Snow, ice and a bike - no worries with a trike! I imagine it makes riding in this weather a bit safer too. That looks brilliant! 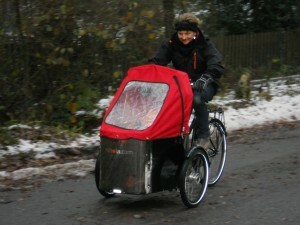 Just the thing for taking my none cycling partner out with me – if only he was Molly’s size! Can you sell ice creams from it? That trike looks awesome Josie. I’m thinking, camping gear on the back, my two dogs in the front, maybe a keg of beer to get me up the tougher hills. I’ve had my Nihola since September, but since I’m in sunny California haven’t had the opportunity to ride mine in the snow. But I’m loving it. No kids, just a vast amount a hauling, which the Nihola excels at! I’ve had people on the roads asking me if I sell ice cream out of it, too. It’s not the US, it’s the UK! 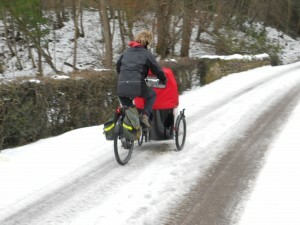 The importer in England is Practical Cycles in Lancashire. I too live in the country having to commute on country lanes. I would love to cycle my girls to their school but fear the drivers. Anyway, I have a question about the Nihola, I have a number of hills to negotiate with two kids, with that in mind how easy is it to ride up hills with that sort of cargo on a 7 speed? We have had our Nihola since May 2000, buying it from Jim Mc Gurn who had got it for a cycle try out show at York. 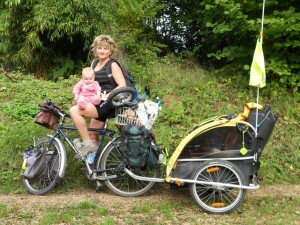 Our son went on the back in a Babybike seat at 14 days old and it carried 2 children and their paraphernalia in style. We used to give rides in it at the school fete. It’s still in frequent use now the children are big enough to unicycle. I’m using it in the snow and it’s our preferred towing vehicle. I’ve used it to fetch 2 trees from the nursery and it loves Farmers’ Market. On occasion it’s carried a labradoodle and even an adult. Oh, not sure I will ever be able to try it with snow, we live in Spain… We are waiting for our nihola to arrive in 2-3 days (please please please let it be 2, only 2!) and we are so excited! We have a “almost 5 years old” boy with palsy and we are looking forward bike days with pleasure. Pascal is too big for the baby seat, and he cannot ride his own bike. With the nihola, we think he will be able to see the view and feel the wind and have fun !